I was pretty sure you’d like this film! The opening of the flick is the best – from the balcony doors blowing open to a dazed Joan Leslie making her way down the sidewalk through the raucous New Years crowd in her nightgown and fur coat. Scrolling through IMDB i noticed that George Antheil provided some original music. This culture critic also give a nice, quick synopsis of Film Noir, James M. Cain and many others (films, directors, composers, ect). I’ve been downloading many of her past installments lately. 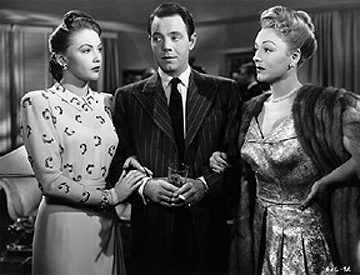 I just finished a couple of good March ’47 b-noirs: “The Guilty” with Bonita Granville and “Fall Guy” – both from the Woolrich nightmare factory. Also you better put “Riff Raff” on your list for September ’47! BTW – Great posts on “Desperate” and “Frear in the Night”! Very cool! As always, a great review. It does seem a lot like it could be a Twilight Zone plot.